The handbook is a practical introduction to preparing to negotiate preferential trade agreements. It is aimed particularly at those who may not have extensive negotiating experience, and it seeks to explain the main steps needed to arrive at an agreement, make it enter into force and monitor its implementation. 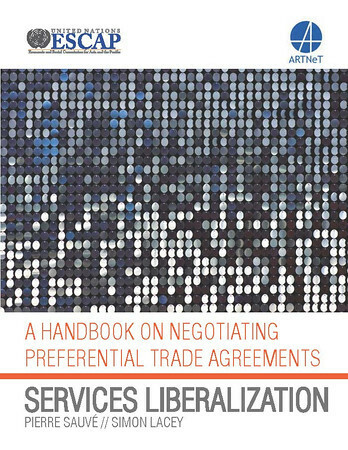 One special value of this handbook is in its coverage of the preparatory stages for negotiations. Moreover, given the lack of resources and capacity in most developing (and especially least developed) countries to address these concerns, this handbook offers ideas and presents the experiences of other countries (often those that are well versed and successful in this area) as well as opportunities arising from utilization of Aid for Trade in this context. Because this training manual focuses on preparing negotiators for services negotiations in the context of a preferential trade agreement or regional economic integration initiative, the authors have refrained from providing an explanation of GATS rules and principles and readers are expected to have at least a basic understanding of the rules governing international trade in services, including those of the World Trade Organization’s (WTO) General Agreement on Trade in Services (GATS). The handbook is one of a series of publications that have been issued by Economic and Social Commission for Asia and the Pacific (ESCAP) in collaboration with associates from the Asia-Pacific Research and Training Network on Trade (ARTNeT) to be used as guides and manuals in policymaking. It is hoped that this latest handbook, as the other similar publications, will become a lasting reference and inspiration-builder for policymakers in the region.